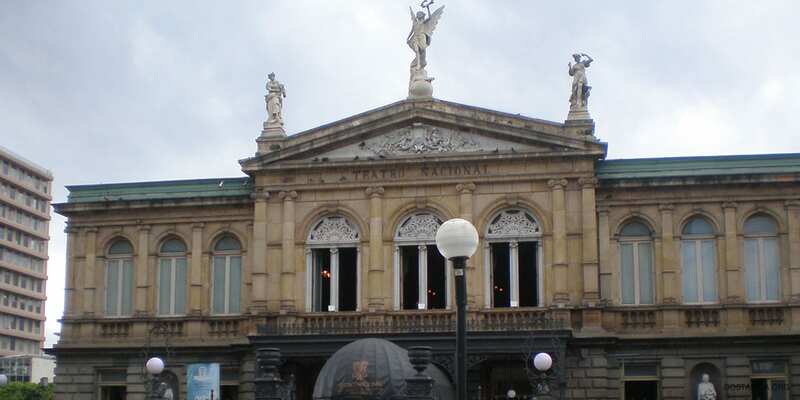 The National Theater of Costa Rica or Teatro Nacional de Costa Rica. A great source of pride among the citizens of Costa Rica. It has played host to many celebrated performances over the last century. You will see plays, Ballets, orchestra, and other beautiful performances. Construction of the Teatro Nacional de Costa Rica began in the later part of the 19th Century. At that point in time, Costa Rica had a minuscule population. And in San Jose, it just reached 20,000 but during this period it was time for growth with Costa Rica’s main export being coffee. This gave a very prestigious crowd of people to be an audience of the National Theater. To build the theater, the president at the time placed a tax on coffee and raised enough money to support building such a theater. The Teatro Nacional had problems when they began construction, but they brought in an Italian Architect to rectify any problems and make building go smoothly. Even with the new designer, the building process was rather slow and was not completed until October 1897. In Front of the National Theater stands two very tall statues the Calderón de la Barca and the grand composer, musician, Ludwig van Beethoven. Inside the Theatre, you will see very high ceilings and the very first thing you will see is the artist Aleardo Villa’s painting ‘Allegory of Coffee and Bananas. This painting is dedicated to the coffee farmers of Costa Rica. Without these workers, there wouldn’t be such a beautiful theater today. The painting was on the five colones paper bill for many years until it was dissolved and made into a coin. Why not step in on your next visit to Costa Rica and take a self-guided tour. Check out this famous painting and see astonishing architecture. Patrons attend the theater to see wonderful performances put on all the time. For example Orchestras, Operas, and Ballets. Walking in through large doors into the theater’s hallways you will see the gold leaf on the walls and bronze lamps to lighten your way. As you walk into the auditorium, you will see the large open ceiling and golden, velvet colored curtains it is like stepping back in time 100 years. Next, sit down in your seat and wait for a treat of a performance to start. Visiting the theater you can expect performances like Algo Sobre un Tal Shakespeare, Philharmonic Orchestra, The Nutcracker and many others. The National Theater is open to Tourists during the day to take a self-guided tour. At lunch, there are normally free musical programs, and on Thursdays at 5:00 p.m. Check out the schedule for this year’s plays and performances there is sure to be something you like for your next trip to Costa Rica. This point of interest is full of exciting performances.